A “minor” royal wedding was celebrated today in Nancy, France when Archduke Christophe of Austria married Adelaide Drapé-Frisch. Christophe is the son of Archduke Carl Christian of Austria and Archduchess Marie-Astrid of Austria (née Princess of Luxembourg) – this makes him the grandson of Grand Duke Jean of Luxembourg and the nephew of Grand Duke Henri of Luxembourg. 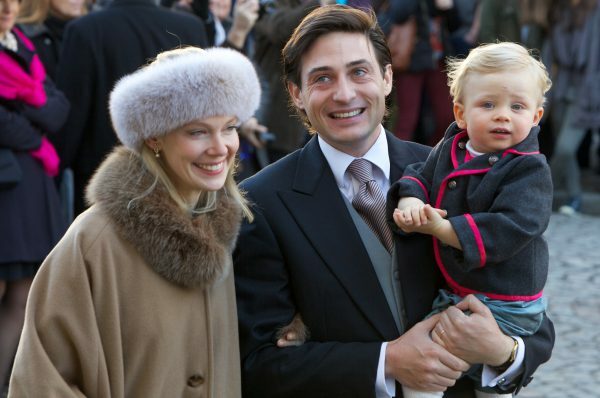 As such, the Luxembourg royals were out again to celebrate a royal wedding! Let’s start with the bride- Adelaide wore an antique lace Habsburg veil- a family piece rumoured to have been worn by Empress Eugénie for her wedding to Napoleon III in 1853 (and also previously worn by her sisters-in-law Marie-Christine and Kathleen on their wedding days). Adelaide anchored the veil with the Luxembourg Royal Family’s Small Diamond Floral Tiara. I thought the lace veil and floral tiara were a perfect compliment to her satin dress. Mother of the groom, Archduchess Marie-Astrid of Austria (née Princess of Luxembourg), wore a dark brown brimless fur hat. I know this is a Christmas wedding but I somehow don’t see the connection between the dark fur hat and her beautiful powder blue suit. Powder = snow = need for a fur hat?! Somehow, this doesn’t work for me. Mother of the bride, Odile Drapé-Frisch, looks fantastic, even with the random explosion of orange feathers. I actually admire a mother-of-the-bride who can pull of orange because I suspect very, very few women can. Sister of the bride, Eleanor Drapé-Frisch, wore a large blue straw molded saucer hat with upswept ‘slice’ brim. While it’s lovely to see colour, I’m not sure this technicolour blue is the best look for her. I think I might have liked it a lot better if her hair was back in a chignon. Sister of the groom, Countess Marie-Christine de Limburg-Stirum, wore a pale greige fur hat with wide, cuff brim. Sister-in-law of the groom, Archduchess Kathleen of Austria, wore a prim chocolate fur pillbox. I suppose if you’re going to wear a fur hat, you might as well choose a big one. I know there is a lot going on here- bouncy hair, weird angled hat- but somehow, I kind of like it. Aunt of the groom, Grand Duchess Maria Teresa of Luxembourg, brought some sparkle to this celebration with a large Fabienne Delvigne beaded headpiece she has worn before. I think this was the right choice for this outfit- any larger hat would have competed too much with the fur collar on her brocade jacket. Cousin-in-law of the groom, Princess Stéphanie of Luxembourg, wore a dark green button base cocktail hat trimmed with grey and caramel twisted bows. I really, really, REALLY want to like this hat but the way she has placed it makes it look like a one-sided green earmuff. Although, if I’m being honest, I’m not sure better placement would help on this piece. Cousin of the groom, Princess Alexandra, wore a grey felt cloche. Top marks to Alexandra for bringing a quintessentially French hat shape to this French wedding. Très chic! Cousin-in-law of the groom Princess Tessy wore a chocolate felt pork pie/cloche hybrid hat. The hourglass shape is interesting but the velvet bow and bland colour leave me on the fence about this hat- I can’t decide if this is boring or twee. There’s also something funny going on with her hair and the perch of the hat. Future cousin-in-law of the groom, Claire Lademacher (soon to be Princess Claire), wore a black felt saucer trimmed with feathers and a large, flat bow.. Call me crazy but I think this combination of hat, chignon, biker coat and faux fur wrap is fabulous. Aunt of the groom, Princess Sibilla, oozed elegance in a classically shaped hat with black felt crown and wide red felt brim.Trimmed with red felt zigzag picks and black quills, the hat is appropriately Christmassy without being too obvious. This entry was posted in Austria, Luxembourg, Weddings and tagged Archduchess Kathleen, Archduchess Marie-Astrid, Grand Duchess Maria Teresa, Hereditary Grand Duchess Stéphanie, Princess Alexandra (Lux), Princess Claire (Lux), Princess Sibilla, Tessy de Nassau. Bookmark the permalink. From all the fur above either in hat form or as trim on coats, suits, what have you I am inclined to believe the dress code asked that fur be included! Actually it is probably because it is winter. The mother of the groom’s suit is so elegant. Too bad she couldn’t of traded hats with the sister of the groom. If was such fun to see all the hats whatever we think of them. I must admit I like Tessy’s whole look, and hate almost everything in Claire’s^- except the color. That being said, about the colors for mother-of-the-bride and sister-of-the-bride, I want to point out that in France, from my own experience, it seems to be the fashion to wear silk in vibrant colors in traditional, catholic weddings. (Btw, I have met the girl who made the mother-of-the-bride brown dress under the orange jacket, she designs and makes silk dresses for weddings – http://www.lespetitesrobes-soie.com/post/Les-Petites-Robes-jouent-%C3%A0-la-princesse ). I’m so pleased you enjoyed this post! Thank you for sharing the link to this designer. That was fascinating information and I had not yet seen a photo of Adelaide’s mother’s dress for the evening party. The colour was beautiful!